Null encoding, which was used for testing and as starting point to develop new algorithms. 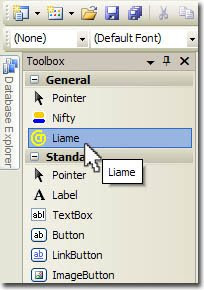 To use Liame in your developments, you have to download it from Google Code, and add a reference to the assembly Liame.dll in your project. You could also insert the component in your Visual Studio's toolbar, so you'll be able to drag and drop the control into your page or masterpage. The ASP.NET server control, as well as a demonstration project, is released under a BSD license. You can download the code at the project's home, in Google Code. Please, feel free to send me your comments, suggestions, opinions or new ideas to get a more effective obfuscation.